Meet Ezra Firestone, an ecommerce expert with some serious clout. He has built a bunch of profitable ecommerce stores and along the way, he has developed a bulletproof framework for selling more with ecommerce stores. Ezra believes that by implementing strategies discussed in this episode, you can increase your total sales by 10-15%. Just think… what would an extra 10-15% of your revenue do for you? How would it feel to have some extra cash in your pocket, all without spending a dime extra on advertising? Listen to this episode of the Email Marketing Podcast with Ezra to find out how. Ezra: We should not refer to them as the “old people”. John: Okay, the “people with beautiful skin people”. John: Hey podcast listener, you’re about to discover insider tips, tricks and secrets to making more sales and converting more prospects into customers with email marketing. 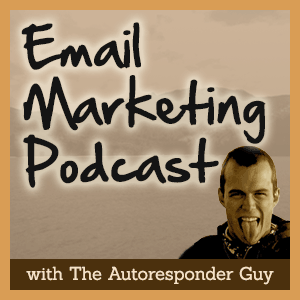 For more information about the email marketing podcast or the autoresponder guy, go to themcmethod.com/podcast. Hey everybody, it’s John McIntyre and it’s time for episode 14 of email marketing podcast where we talk about the top tips, tricks and secrets for making more sales, growing your revenue with email marketing. Today I’ll be talking to Ezra Firestone from brownboxformula.com and smartmarketer.com. I met Ezra at an event in Sidney a few months ago and I was completely blown away by the content he provided. He spoke for about 2 hours, all about e-commerce. He had an entire, 12-step system about how to build an e-commerce store, how to drive traffic to it and how to make money with it. The way he presented it made it so easy to understand that I went to him and I asked him about email marketing. I wanted to find out if he could do a podcast on it and that’s what we’re going to do today. We’re going to talk about email marketing as it applies to e-commerce stores. In this episode, you’ll find out how to boost any e-commerce stores revenue by 10 percent to 15 percent just by implementing an email marketing campaign. It’s very basic, straightforward stuff, but you need to execute on it. You’re going to find out about the three main types of e-commerce customers and how you need to treat them to get the best results. You’ll get Ezra’s cart abandonment sequence that he has tested in numerous markets so it’s proven to work, plus you’ll also find out how Target figured out a teen girl was pregnant before her father did, which is kind of insane and a little bit creepy but it’s very, very interesting stuff. To get show notes for this episode of the email marketing podcast, go to themcmethod.com/ep14. Thanks for the review David, I totally agree. I’ve listened to podcasts before and they just take way too long to get into it, which maybe I’m doing that right now and thank you again for the review. If anyone listening wants to leave your own review and get your website read out on the show, go to themcmethod.com/podcast. Now, I’ve got some good news. There was no episode last week and some of you might be wondering why. I was at a conference in Europe in Lithuania of all places with Simon Black and Craig Balantine. Both of them use email, some of the coaches were there too, big time internet marketers and kind of underground though, but they shared some amazing information that I think is really relevant to me and I think it could really help a lot of people who listen to this. No promises, but it looks like I’ll be able to have Crag Balantine and some of the other coaches on this podcast in the next few months and I’m sure they’ll bring their A-game with some amazing, killer information so stay tuned for that. I don’t want to make David too angry, so without further ado, let’s get right into today’s podcast and talk to Ezra Firestone. It’s John McIntyre here, the autoresponder guy. I’m here with Ezra Firestone, an e-commerce expert. I recently had the privilege from hearing from Ezra in Sydney and he spoke a million miles an hour but I don’t think it was because he was nervous, but because he had so much to share. He went through his entire strategy and since this is an email marketing podcast, we are actually going to be talking about e-commerce stuff, the big picture kind of stuff. I thought we would talk about e-commerce email marketing because I don’t know much about it and I’m sure most people listening to this don’t know much about it either. That’s why Ezra’s here. Ezra, how you doing today? Ezra: Man, I’m doing so well. Thank you very much for having me on the show and thank you listener for listening in to us talk about email marketing. It’s awesome. I feel so blessed every time I get to come on a podcast or on a show because I know that people are taking time out of their lives to listen to me, which is really nice. That’s the most valuable thing that someone has is their time and they’re choosing to spend it with us. That’s awesome. John: Absolutely. It’s kind of crazy when you think about it, they’re probably in their car right now or the gym, or walking around their neighborhood, they’re just living life while they’re listening to this. Ezra: I know, it is a trip and a half is what it is. John: (Laughs). That’s pretty good. Ezra: We can dive right in to email marketing for e-commerce, specifically … the good thing about email marketing for e-commerce is that it is not particularly difficult. It’s pretty straight-forward. It’s probably the most straight-forward type of email marketing there is because you are not doing much persuasion. You’re not doing much selling. You’re mostly doing relationship building when you’re doing email marketing for e-commerce. I’ve kind of broken it down to three main segments that we can talk about. I’ll just jump into it if you want. John: Sure, let’s do it. Ezra: You’ve got three main sort of segments of customer who you are talking to when you have an e-commerce store. You’ve got the guys pre-purchase, and the gals lets not be chauvinists. You’ve got the guys and gals who are pre-purchase, who have not actually bought something from you but have hopped on your email list because there was an incentive on your website. You’ll notice all the big sites are starting to do this, putting off these little pop-ups that say, “Hey, get 15 percent off your first order, enter your email address here.” They understand the value of a lead even in the physical product world the value of a lead is so, so high because people leave. They come they check out the products and they take off. If you can capture that lead, if you can incentivize them to opt in for some level of discount on the products, you’ll generate often and you’ll be able to followup with them and make sales, which is what it’s all about. You’ve got your pre-purchase, before they actually purchase, we’ll talk a little bit about that, you’ve got your cart abandon. These are the people who made it all the way to the shopping cart, they searched your products. They were searching somewhere, Amazon, Google, who knows, they ended up on your website, they took a look at some products, they actually added one to their cart and then they dipped out and said, “You know what, I’m bailing on this transaction, this isn’t for me, not right now … back off.” Maybe they didn’t say all that, but … you get people who abandon your shopping cart and that’s sort of another segment of people who you deal with and a little different fashion when it comes to email marketing. Then we’ve got our third segment of people, which are post purchase people who have actually bought from you, people who have engaged with you and purchased from you. Those are really the three main segments of user who you are communicating with and as we know and as I’m sure you talked about in previous podcasts, when it comes to email marketing it’s all about knowing who you’re communicating with and why. We look at email marketing as a form of communication with another person, not as just an email to some random thing that they want to buy from you, but an actual communication to another human being who is considering doing business with you. When you frame it that way you’re now able to write emails that are really person to person, which is what it’s about. John: Absolutely. Before we go on, I always bring this up with people when they mention it. I think it’s one of the key elements of good marketing is that it has to be relevant but you just have to understand exactly who you’re talking to. You don’t send a cart abandonment email to a pre-purchase customer or vice versa. The reason why is that you have to have that baseline level of empathy where you understand what the person wants, because everyone wants to feel understood. I just think this is such a core issue and if people can nail this part of it, it’ll make all the other parts work properly. Ezra: It really will. While we’re on the subject of what people want from you, we can break it down … I’ll break it down for you right now. Ezra: Here’s what people want. Attention and approval. That’s what they want. They want to know that you’re paying attention to them, that you have noticed them, that your attention is not just on trying to sell them stuff, but you’re actually paying attention to them as a person and that you approve of them. People want to be approved of. If you can do those two things in your marketing, you’ll be very successful. Let’s talk a little bit about pre-purchase email marketing when it comes to e-commerce, when it comes to physical product, e-commerce businesses. Someone has come to your site, they’ve opted in, they’re on your email list, what now? You don’t freak out, you don’t get scared. Some people do, they’re like, “Oh my God, I have these people on my email list, what do I do?” That’s totally righteous because it is scary to think about communicating with people with the goal of selling them stuff, but with e-commerce it’s mostly about relationship building. For the most part people know what your products are. Physical products are not particularly difficult to understand. This is a salt shaker and I understand that. It’s not a lot of education around the product line. It’s more communication with a customer … I’ll just give an example with Boom by Cindy Joseph, which is our skin care company. We are selling organic skin care but our emails and our marketing are not talking to people about that skin care line. Sure we mention it, but mainly we’re talking to people about things like menopause, sliver hair and aging and wrinkles and all of the experiences that our customers are having. If you know who your customers are, for example if you’re selling pacifiers, you’re customers are probably parents. If you’re selling man-scaping kits, your customers are probably metro-sexual men who are interested in grooming themselves. You know who your customer is based on the product that you’re selling and you can then craft messaging that’s relevant to that customer’s life that isn’t just specific to your product. Pre-purchase is all about relationship building, education about the product line, about who you are; just a little back story on that. My wife is here, she’s in the kitchen, she’s not actually listening in, but she always gets on my case for the fact that I always say, “So and so around this topic”. It’s not proper English. You should be saying, “About this topic”. I continually make that mistake and she’s right here so I have to be in good form because this is going out to the public audience. What was I saying? I completely forgot … I got flustered because I knew she was listening to that. (Laughs) I know what I was saying, education about the topic, education about the product line, your viewpoints and opinions. I’ll give you guys practical examples in a second. Your viewpoints and opinions on topics and conversations that are relevant to the community. If you’re selling cycling gear, you’re going to be talking about Lance Armstrong and the fact that he’s a dope fiend and all this stuff. You’re going to be having conversations like that in your emails that are topics that are relevant to your community. What do these emails look like? We do them in the form of video blogs or product guides or top 10 lists or really any kind of educational content that’s geared toward building a relationship with the customer. The best is if you can get face time with your community. That’s the funny thing, email marketing is now turning into sending people emails, trying to get them to watch a video of you talking. You don’t have to actually be an expert copywriter; you can write three sentences, “I created a new video for you.” It can just be you on video, or you could do blog posts. People still do read, it’s not out of style. Really, our approach to the pre-purchase segment is essentially video blog where we create blog posts that are topically relevant like I just mentioned and then we make a series of them, we send one every three days after someone after someone opts in that builds some kind of a relationship or has some information or is relevant in some way and then also mentions our product and does a soft sell. They’re really, really soft sells all geared toward building a relationship with the customer and getting them to know us and our brand and getting them to watch our videos and letting them know our unique selling propositions, why it’s good to buy from us, why we’re a good company … all that kind of stuff. All the stuff that you do in your marketing, we do in our email marketing but our pre-purchase is really all about relationship building. Any questions on the pre-purchase? Ezra: (Laughs) The old people … no. Let’s hope none of the Boom people are listening to this. They’re lovely. Yes, for the most part, they’re baby-boomers and they are getting on in age but that’s … we should not refer to them as “the old people”. John: Okay, okay, the people with beautiful skin people. John: When you put out content … a lot of people therefore think you’re going to talk about skin care or whatever it is and I think what’s important is you’re getting a certain type of attention and it’s their attention. To do that, all you need to do is just put out content that’s relevant to them and it comes back to understanding the customer. That’s what some people struggle to understand sometimes is that you don’t always have to talk about the product. As long as you keep the attention of the target people you want, you can talk about anything. Ezra: Yeah, absolutely. Most people get really hung up on that. They say, “What more can I say about my products? What more can I really talk about? I don’t want to just sell super hard. I don’t want to just keep talking about these products.” It comes up a lot on group phone calls and when I do … it came up on this training I did this afternoon. People have a hard time being pushy and selling and you don’t have to do that. It’s really about relationship building. You don’t have to push your product super hard. Of course, if you’re smart you’re going to mention your product. You’re going to soft sell. People understand that you’re an e-commerce … they do not think that you are not a store that doesn’t offer product. You want to be true to who you are and you definitely want to do soft selling and mention your products where relevant but it’s on the main focus of the communications pre-purchase. John: Okay. Let’s get onto cart abandons. What do you do there? John: We can easily put that on the post. Ezra: Alright, let’s do that. I’ll put up a little slide deck that I did with a guy, how to structure seven-day cart abandonment sequences but it’s pretty straight forward. The first email is kind of like, okay we see that you are sort of standard cart abandonment, we see that you were in our shopping cart and the cool thing about e-commerce is there is a lot of technology available for this these days. It’s kind of been built in where you can scrape the images for the items that were in their cart, scew number, the price of the cart itself and then you can send them an email that has the actual products that they were looking at and based on the value of the cart, you can give them a discount. If it’s like a $100.00 cart, you can give them a five percent discount. If it’s a $200.00 cart you can set that dynamically. You can do some really, really fancy stuff. You can send them an email and say, “Hey you were thinking about buying these products and here they are”, reminding them these are the products you were looking at. The second email is more of a social proof that comes a day or two later, “We noticed that you still haven’t completed your order. Here’s all the unique selling propositions, here’s all the reasons you should buy from us. Here’s why we’re good.” A, B, C customer service, quality, shipping; basically testimonials telling them why they should buy from you again and reminding them that they have a cart; social proof. Third email would be some kind of scarcity; “Hey you know, your cart is about to expire. Here it is again.” They’re kind of all … I don’t have this in my head, the whole sequence, but they’re all basically just reminding people the fact that they were going to buy from you at one point and then re-enforcing why they should with testimonials and social proof, unique selling propositions and all these different things. The fourth email and onward, you offer some kind of incentive, five percent off, ten percent off, et cetera. It works extremely well. Really, it’s about the followup. I’ve seen some really terrible cart abandonment sequences that convert ten, fifteen percent … any cart abandonment sequence that’s done half-way decent will convert a solid amount of cart abandons into buyers. It’s going to vary depending on market, depending on value of the products being sold, average order value. There’s a lot of variables that will tell you what percentage you will pick up, but if you put in a cart abandonment sequence it does not matter if you’re not a good copywriter, if you’re not doing anything fancy, you will sell more product. John: Okay. It sounds like there’s a best way to do it. The people have kind of figured out I guess over … maybe they haven’t, but you send one the first day, one a day later and a one a few days after that. Ezra: Yeah, we do it every couple of days; we do about seven of them. Ezra: There’s so much information on … cart abandon is such a big problem in e-commerce, it’s such a big topic of conversation because of how many people abandon shopping carts because of how high that ratio is. It’s such a huge topic that there’s been so much time and energy dedicated to solving this problem, there’s so many pieces of software out there that help with this, it’s really becoming an industry standard thing. You can just Google it and you’ll find more information than you can possibly want from fantastic marketing blogs, like practical e-commerce and getelastic.com; all about this topic. We don’t have to spend a ton of time talking about it here, but it’s a topic of discussion that’s completely relevant for physical product business owners. Ezra: Post purchase. Essentially with post purchase you’re doing a mix of content marketing and selling. Post purchase you can be so much more aggressive because they already bought from you, which means they already liked you enough to buy from you one time. All that stuff I was talking about from a content marketing perspective, pre-purchase; video blogs and educational guides and educational webinars and blog posts, interviews and all this kind of content that’s geared toward educating your customer is a very, very good idea to do post purchase. It’s good to have some kind of regular schedule. We do things like “Saturday’s with Cindy” or a story that I consult with, “Sundays with Sarah”. Some kind of regular, education/entertainment relating to the brand and relating to the product line because it gets people used to seeing you ever week. Then we take those emails that we send out and we promote them on Facebook to our Facebook community and we basically just make sure we are engaging. We email it out to our subscribers, we post it to Pinterest and we put it everywhere. We syndicate it so that everyone in our community is seeing content from us on a regular basis so that when we do make sales offers, we get a much higher take rate on those offers because we’ve been in constant communication with our customers each week for the past month and most e-commerce stores just send out a sale email once a month. You will see a significant boost in revenue from those sales emails and the conversion rates in those sales emails if you’re sending out content on a weekly basis. I recommend at least on a weekly basis; we do it on a weekly basis that you do a content email of any kind and then you do sales emails. This can be everything from liquidations, discounts on a certain product line, holiday sales. You can just make up … there’s thousands of holidays people don’t even know about. A lot of people in the e-commerce base do sales emails for every holiday for, for Easter, Man’s Chest Hair Day, for Beard Day, for all kinds of crazy stuff, holiday’s you haven’t even heard about. Essentially, post purchase is very simple. Its consistent content marketing mixed in with a monthly or bi-monthly sale and there’s got to be some excuse for the sale. It can’t just be, “Hey we’re doing 20 percent off.” “We’re doing 20 percent off because of X, Y, Z”, you’re giving some reason why you’re doing the sale. That’s really it. It’s pretty straight forward stuff. I’m not the world’s foremost expert on email marketing for e-commerce. These are just the basic strategies that work quite well. There’s not a whole lot of sophistication to email marketing for e-commerce. It’s not a huge topic of conversation within the community. A good solid 10 to 15 percent of your sales will come from email marketing if you have a legacy store that’s been around awhile that has a bunch of customers that are doing well. You’ll see a good chunk of your sales coming from email marketing, but 80 to 90 percent of your sales are not coming from this avenue. Most people are only seeing like three percent because they send that monthly sales email. They’re not doing pre-purchase relationship building. They’re not doing cart abandons and they’re not doing post purchase relationship building and offers. John: Okay, that’s really interesting. The whole content marketing thing gets me sometimes because people are doing all this content stuff, but they’re not selling, which is what they really should be doing. It sounds like in this situation content marketing can really work. It just keeps you on their radar. John: When you’re finally up for that sale it’s just going to do so much better. Ezra: Exactly, it really does. The think about the content each week is you end up selling. We make as much sales from our weekly content as we do from our sales emails because we’ve got soft sells in there. “Hey we’re doing a blog post on how to make a felted Easter egg. Buy the way, if you want to buy the felt to make this Easter egg, you can click right there and do it. Its education but we are working in the ability for people to purchase. Every time someone sees your stuff, they’re going to your website, which means they might be, “Oh yeah, I wanted this thing” and go buy it. Ezra: I was going to mention … it’s kind of a combination of retargeting and email marketing. If you have a sophisticated re-targeting platform, something like Ad Maisley or some of these more sophisticated retargeting platforms, what you can do is … Amazon’s got a special ability to do that because they have the email of their users. Right? Ezra: They way you’re doing that from a physical product, the way that you’re kind of doing that on a sort of lower level e-commerce store is through cart abandons. You don’t have the emails of your customers so you can’t just … when someone checks out an item on your store, you can run retargeting ads which you absolutely should be doing through networks like Google and Ad Role and Ad Maisley and things like that and retargeter, but you don’t have the benefit of having the … for the most part, most of your people are not going to be logged in users. You won’t be able to just shoot them an email over. You do get to accomplish that a little bit through cart abandonment. It’s like Amazon’s got most of their users logged in and they’ve got a custom built tool to be able to do that. If you have someone’s email … there are no products out there that I’m aware of that allow a small scale merchant to pull that off, but it’s a very cool thing. John: I think it’s awesome. It’s kind of creepy but it’s cool. Ezra: It really is. It’s freaky what they’re doing. They’re just unbelievable. It’s like that article about how Target predicted this teenage girl’s pregnancy before her dad knew she was pregnant. Have you heard that, have you read that? John: Yeah, what book was that in? Ezra: It was just an article on Huffington Post or something. We should find it and link to it because it’s unbelievable. It won’t be hard to find that one. That got a lot of press. Ezra: They knew she was pregnant and her dad didn’t. Her dad flipped out because they sent her a card. It was like, “Here buy these Pampers for your kid” and whatever and her dad was like, “Why in the world would Target be sending this to my teenage daughter?” He was flipping out and he found out she’s pregnant. They were able to work out she was pregnant before he was, which is so scary. John: Yeah. (Laughs) It’s a cool story. I’ll see if I can find it and link to it. Ezra: Yeah, if you can’t find it, I’ll definitely find it. It’s out there. It’s easy to find. John: Cool man. We have time so before we go, give yourself a plug and tell them where they can find you. John: I also … I’m listening to a few episodes but “Think, Act, Get” is your podcast. Ezra: Oh, dude, definitely check out “Think, Act, Get.” It’s not specifically relevant to …well it is, it’s more a lifestyle mindset, talking about how you be in the world relationship to yourself and other people and how you behave and act and how you think. It’s about more than just marketing and entrepreneurship. If you’re interested in that kind of stuff, it’s getting a lot of positive feedback so check it out. John: Alright man. I really appreciate you giving your time and to chat about email marketing for e-commerce stores. Ezra: Thank you so much. I appreciate you having me on the show. John: Hey everybody, thanks for listening. If you want to discover more insider tips, tricks and secrets about driving sales with email marketing, sign up for daily email tips from the the autoresponder guy, to go updatecopy.com/podcast, sign up, confirm your email address and I’ll send you daily emails on how to improve your email marketing and make more sales via email. You’ll find out why open rates don’t matter and the seven letter word that underlies all effective marketing and much more. Hey Man! Awesome podcast… Didn’t see the download for abandon cart emails though. Can you still link to those? Hi Craig, check the slide deck link. They’re not templates – just instructions on how to create it.